You guys know I love to make homemade all-natural cleaners, but I hadn’t yet made my own window/glass cleaner! I stopped using the commercial blue stuff a while ago, but I’ve been getting tired of paying for the pricey all-natural ones you can get at the store. I figured that making my own DIY glass cleaner shouldn’t be that hard (as much DIY cleaners are pretty easy to put together) and I was right! And better yet- this homemade window cleaner doesn’t leave streaks! 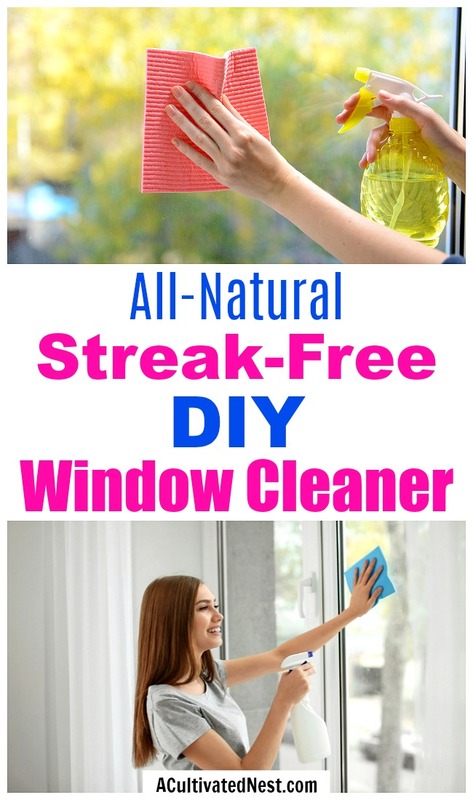 Check out my easy tutorial for how to make an All-Natural Streak-Free DIY Window Cleaner! There are a lot of different ways to make a DIY window cleaner. You can even make one by combining other commercial products together. I’ve also seen some people make glass cleaners using ammonia, which technically is a natural substance. But ammonia is toxic, so I wanted to make an ammonia-free window cleaner. I wanted this to be as safe, easy to put together, and natural as possible, and in the end was able to do it with just 3 ingredients! This DIY window spray will clean and freshen the glass on your windows and mirrors, without leaving annoying streaks behind. Plus it’s kid-safe and pet-safe! At worst it would cause an upset stomach in your dog or cat if they for some reason drank a lot of the mixture, but I know that my dog hates the smell and won’t go near anything with vinegar in it. If you have hard water or are using essential oils that aren’t really pure, you may see some streaking with this DIY window cleaner. So I recommend only using therapeutic grade essential oils, and you can use bottled distilled or purified water to avoid all the minerals in tap water (even non-hard tap water contains mineral contaminants). * If you don’t have white vinegar, technically apple cider vinegar can work as well. Just make sure to wipe the window/mirror very well afterwards, as apple cider vinegar contains a small amount of sugar that could potentially make surfaces sticky. But since this mixture is diluted and wiped away, this shouldn’t be much of an issue. ** Warm water just cleans better than cold water, but room temperature or cold water is also fine. There’s no need to reheat your mixture once the water cools off. *** If you don’t have essential oils, you could instead make some citrus vinegar to use. In that case you’d use 1 cup citrus vinegar in place of the white vinegar. 1. Pour all of the ingredients in your bottle. Shake to combine. 2. 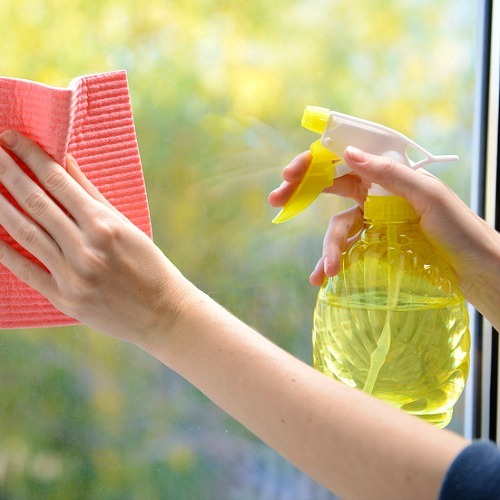 Spray the DIY window cleaner on your window or mirror, then wipe the surface clean (ideally with a microfiber cloth). If the glass is especially dirty, you may have to spray and wipe/scrub several times to get through every layer of grime. Always shake the bottle before starting a cleaning session to redistribute the ingredients. If you have kids and you’re using a clear spray bottle, consider adding a drop or two of natural food coloring to avoid the kids thinking this is a spray bottle of water. Adding a label to the bottle would also help avoid confusion. Luckily, while it’s not tasty, it’s technically safe to ingest diluted white vinegar (drinking it is actually a natural way to soothe a sore throat), so if a mix-up did happen, it wouldn’t be dangerous. As this streak-free DIY window cleaner uses vinegar, you’ll want to be careful when using it around porous stone (like marble). The acidity of the vinegar (and the citrus essential oils, if you use them) can damage the stone. Vinegar may also eat away at the finish on hardwood floors, so if you spill/drip any on hardwood, clean it up quickly. It’s unlikely to cause noticeable damage right away, but better safe than sorry. Since it’s all-natural, this cleaner can’t cut through grime as quickly as a conventional, chemical-laden cleaner. If your windows are really dirty, either wash them several times with this spray, or start with a 1 to 1 mixture of dish soap and water first, then finish with this spray. 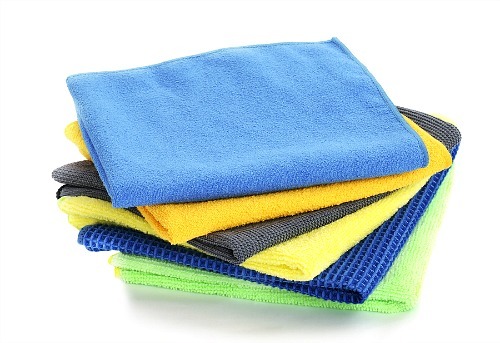 If you are getting streaks after drying your glass with paper towels or normal cloths, consider getting microfiber cloths. I use microfiber cloths whenever I use this DIY glass cleaner, and I never see streaks with it. Some people also swear by drying their glass with newspaper, or even coffee filters! And others love to use a squeegee (overlapping your squeegee strokes reduces the chance of streaks). So try some different dryers in conjunction with this spray to see what works best for you. Also make sure you’re not washing your windows when the sun is directly hitting them. The sun heats up the window glass, which makes it more likely that streaks will be left behind, regardless of what you’re using to clean your windows. Lastly, be safe. If you’re trying to clean windows outside, always be aware of your surroundings. You don’t want to accidentally step in an anthill because you’re so focused on getting your windows clean! And if you’re cleaning windows up high and you have to use a ladder, always have someone hold the ladder for you and never overextend your reach. You might want to consider getting a high window cleaning tool so you don’t have to get on a ladder to begin with (this one on Amazon extends 10 feet). 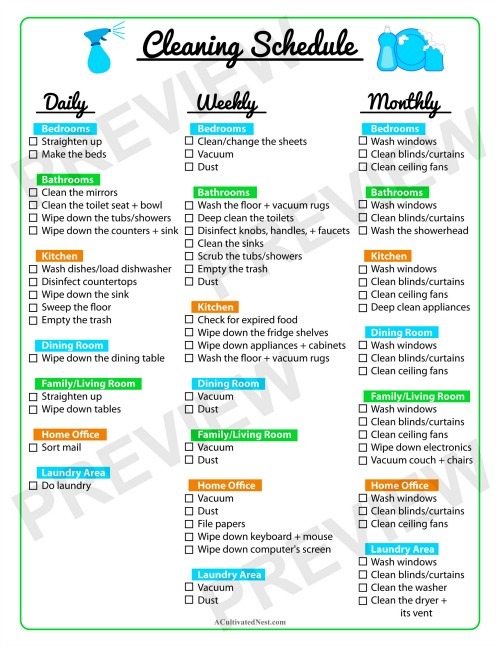 If you’re worried you’ll forget to keep up with cleaning the glass in your home, you should get my free printable cleaning schedule. 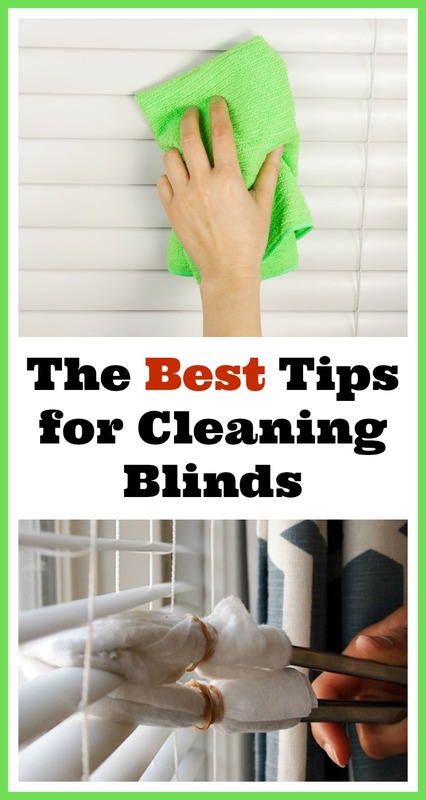 It includes reminders to wash the windows and mirrors in your home, plus lots of other things! I recommend cleaning your windows only once a month, but mirrors in bathrooms should be cleaned pretty much every day (because of toothpaste and hand soap splatters). You can find the cleaning schedule in my post on how to use a printable cleaning schedule to keep your home clean. This DIY streak-free window cleaner is easy to mix together and easy to use. Now you can keep your home’s glass sparkling, and your home’s enviornment free of extra chemicals! Do you usually struggle with streaky windows?